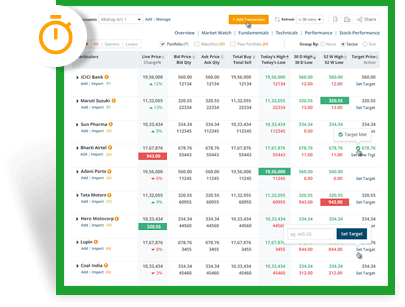 Create a watchlist to start tracking prices for your shortlisted stocks. Get real time trading updates of the day's profit and loss. Note: New Portfolio is available to only selected users for now. All our registered users will be migrated to all-new portfolio in the next couple of months. Stay tuned! Life is good when you’re on top of your finances. At moneycontrol, we help you manage it all in one place, effortlessly.